This autumnal limited release from the crew at Eagle Bay is possibly their juiciest to date. 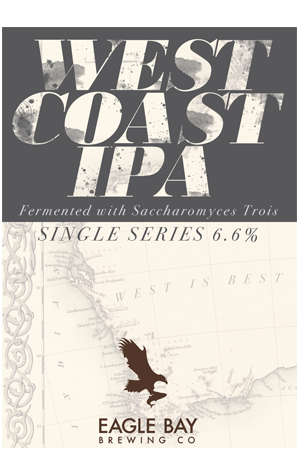 Although still slotting well within the brewery's reputation for brewing classic styles, this West Coast IPA has been fermented with Saccharomyces Trois, a Belgian strain that adds big juicy esters of pineapple and lychee, along with a touch of funk for good – and contemporary – measure. The specialty yeast can't claim to be responsible for all of the juice factor in this easy-to-crush IPA, however. A generous dose of Citra hops added throughout the brewing process contributes their trademark citrus and grapefruit aroma; a lengthy conditioning phase and a hefty dry hop of Citra Cryohops added late on in fermentation further ensures maximum hop character and minimal astringency. If it sounds like your bag, you'd best hope you can try it at source or one of the select few venues to secure it in WA.